Here's another week of REX -- B&W dailies, of course. You can't see these on Comics Kingdom -- so thats why I share them here. 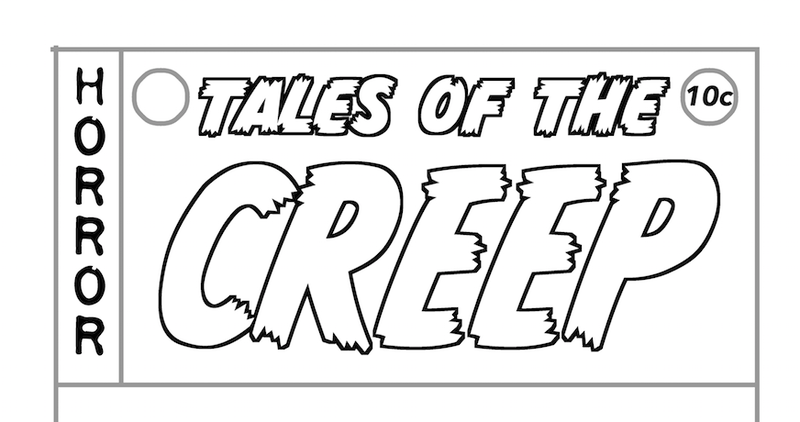 I also thought you might enjoy seeing the logos I made for the comic books that have appeared in the strip. It didn't make sense to redraw these every single time -- so I whipped these up and have reused them multiple times -- dropping them in and changing them to fit perspective, etc. And no. I'm not going to draw and write complete interiors for any of these -- though it certainly is a fun notion to consider...! With Hank Jr.'s announcement that there is more than one stack of comics in the attic, Buck and Rex rescue the rest. I should note that they are not ripping up the floorboards -- but just pulling this stuff out from underneath. I once lived in a house with an attic that had easy access to the space under the floorboards and the notion of how simple it would be to hide stuff under there always stuck with me. This story allowed me to use the idea at last. The artwork would have been rolled up, like tubes, to fit. 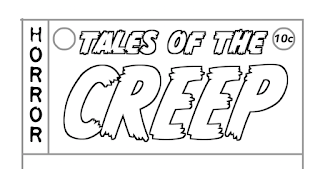 I never stated that in the strips, but showed the art pages curled up some to hint at it at least. The monetary value is based on the notion that these are mint/near mint artists' file copies equivalent to EC titles -- signed by a major artist. The art value is also based on sales of original EC art. I was amused that one person posting in the Comics Kingdom comments section complained that my math was off regarding five hundred thousand being half a million! This is why I can't take those comments too seriously. So many folks there also jumped to the conclusion that Rex was going to keep the comic books -- and this was going to be another "Morgans get free stuff" story. Nope. It was always my intention to turn that overdone trope on its head -- and have Rex insisting on returning the treasure trove. 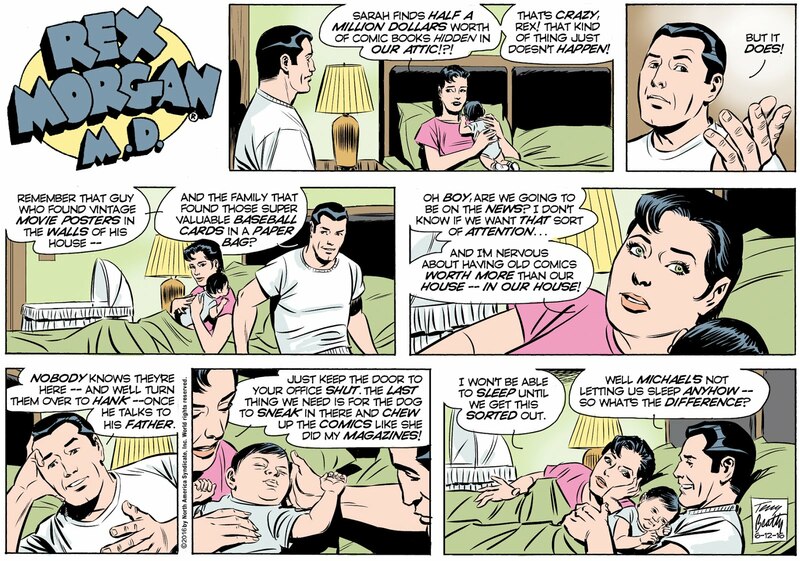 I also shake my head over the snarkers who were all aflutter over me retconning the history of the Morgan's house -- when that goes back some eighteen years -- who seemed unable to recall that Rex has a home office/study -- well established in very recent strips. They thought Rex was going to haul all this stuff to the clinic? Gee -- you'd think some of them are just looking for something to gripe about...? And let me address the house origins once again. Yes, I'm rebooting/retconning some elements in the strip so we can move forward, unencumbered by decades of largely inaccessible continuity. The strip has, aside from four comic books in the 1950s, never been reprinted in book form. King Features does not have a complete run of it in their files. There are years and years of the strip that I have no access to whatsoever. I'd love to see Frank Springer's run on the feature -- but aside from a handful of examples on the web -- it's no where to be found. I have a few clippings from Fernando DaSilva's run -- but no complete stories. King's online archive begins toward the end of the Tony DiPreta period -- October 1998. And I've read the earliest available strips. In them, a recently married Rex and June (pregnant with Sarah) are selling June's house, and there is talk of them putting the proceeds of the sale toward the "new house." They move into the "new house" in 2000, just after Sarah's birth (yes, the six year old was born sixteen years ago) and the hiring of nanny Heather. There is talk of it being their "dream house." Nowhere, in any of the archived strips from this period is there any mention of the house having been newly and specially built for the Morgans. I have no doubt this was established -- as long-time readers remember it -- but it had to have been established in strips predating what is available in King's archives. So -- as far as I'm concerned, the history of the house, prior to the Morgans moving in, is for me to decide as it suits the purpose of the story. Retconned. Rebooted. Changed. And it's all moving forward from here on.